Stephanie is a native of Rockingham County and a 1988 graduate of Rockingham County Senior High School. She is the daughter of Sandra Edwards and the late Jerry Edwards. Stephanie is married to Kevin Andrew of Climax, NC. Kevin is a Service Technician for Medtec, Inc. They have two daughters, Lauren and Devin. They are members of Providence Friends Church. 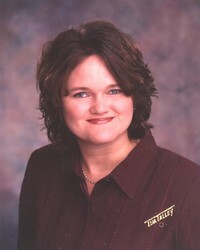 Stephanie was employed with UPS from 1988-1995 as an Administrative Assistant. In 1995, she joined TRC Staffing Services as the Operations Manager. Stephanie obtained her salesman and broker license through Dan Mohr Real Estate School in August 2002. With over 7 years of experience in customer service and inside sales she looks forward to bringing buyers and sellers together. Stephanie understands that personal service is the most important tool for each transaction. Stephanie obtained her ABR - Accredited Buyer Representative designation in December 2002.